Chris Carrow (left) and Lisa Wingfield (right), also known as Carrot and Pickle, pose for excited children watching them from the window. Carrow and Wingfield have been married and performing together for over 20 years. This was photographed on May 6, 2016 at Rawhiti School in Christchurch, NZ. Lisa Wingfield entertains the students of Rāwhiti School as they await Carrot and Pickle's performance. The students were ecstatic when Wingfield and Carrow arrived, watching them set up from the window. This was photographed on May 6, 2016 at Rawhiti School in Christchurch, NZ. "There’s been less family shows in Christchurch ever since the 2011 Earthquake hit because people are really just worn out from fighting with insurance companies and earthquake commissions to get their houses repaired. We haven’t done that many family shows, but this year it seems to be picking up again," says Wingfield. Wingfield (left) and Carrow (right) pose for pictures with the students after their performance on May 6, 2016 at Rawhiti School in Christchurch, NZ. "I love seeing the joy in children when we perform," says Wingfield. Lisa (right) looks over at Chris (left) before heading out to their performance. Lisa goes through her kitchen cupboard in her newly remodeled Christchurch, NZ home. 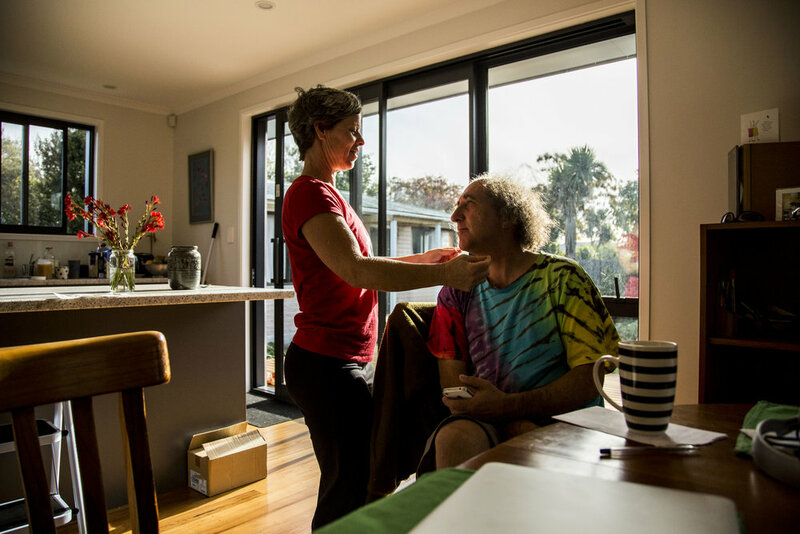 Chris Carrow washes his clown shoes in his Christchurch, NZ home on May 6, 2016 in preparation for his show with Wingfield at Rāwhiti School. "I guess clowning, in a way, is about truth. You have to be true to yourself and you have to be true to what you’re doing. The clown is only there because we're trying to lighten up the day. We’re here to entertain and hopefully make a difference and make people happy." Wingfield (left) and Carrow (right) embrace in their Christchurch, NZ home on May 3, 2016. In addition to losing their circus school, their home was also destroyed in the aftermath of the earthquake. They've just recently finished rebuilding their home. Wingfield embraces her cat in her newly rebuilt Christchurch, NZ home on May 3, 2016. "She can do all sorts of tricks!" Wingfield (left) helps a student with her handstands during a class at the Christchurch Circus Centre in Christchurch, NZ on May 10, 2016. 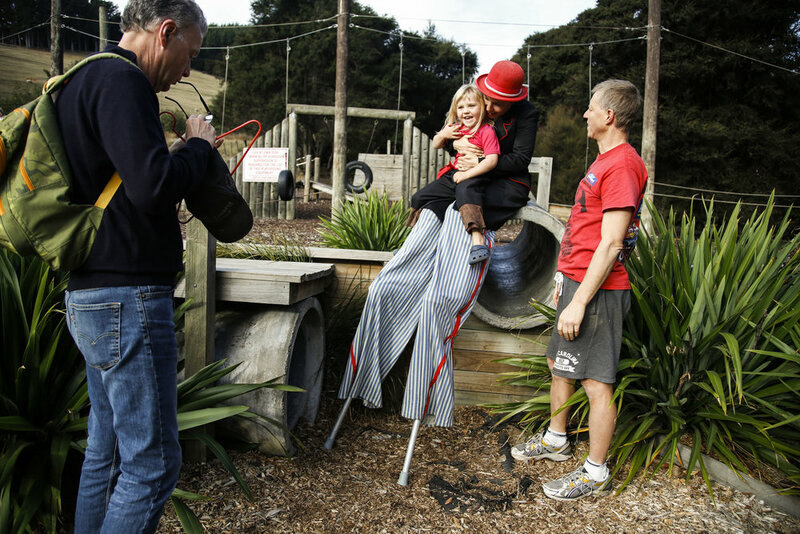 Wingfield and Carrow lost their original circus school to the 2011 Christchurch Earthquake. "We lost our circus school and started doing community circus workshops in town. But then that building had to get demolitioned as well. So we had to find a new venue. Luckily enough, Chris is really good at hunting for stuff." Wingfield and Carrow teach a circus class at the the Christchurch Circus Centre on May 10, 2016 in Christchurch, NZ. "We did lots of shows to help people deal with stress when food was being handed out and people were given support. It was interesting for us because whatever our own personal fears were around the next shake happening, we had to find that inner resource to get into role. You’re not just dressing up when you perform. It’s a space that you go into. So we got into this clown space to be available for people, when we didn't feel positive at all." A student at the Christchurch Circus Centre hangs on a trapeze during class on May 10, 2016 in Christchurch, NZ. Olli Ricken puts together a toy Bentley for her boyfriend, Neil Wooten, as a joke in her Christchurch, NZ home. Olivia Ricken (center) and Auriel Ricken (center-front) eat popsicles together in their Christchurch, NZ home on May 26, 2016. Olivia Ricken, a clown and circus performer, was also deeply affected by the 2011 Christchurch Earthquake. She was forced to move out of several homes with her five year old son, Auriel, in addition to losing her circus school building at the Christchurch Polytechnic Institute of Technology. 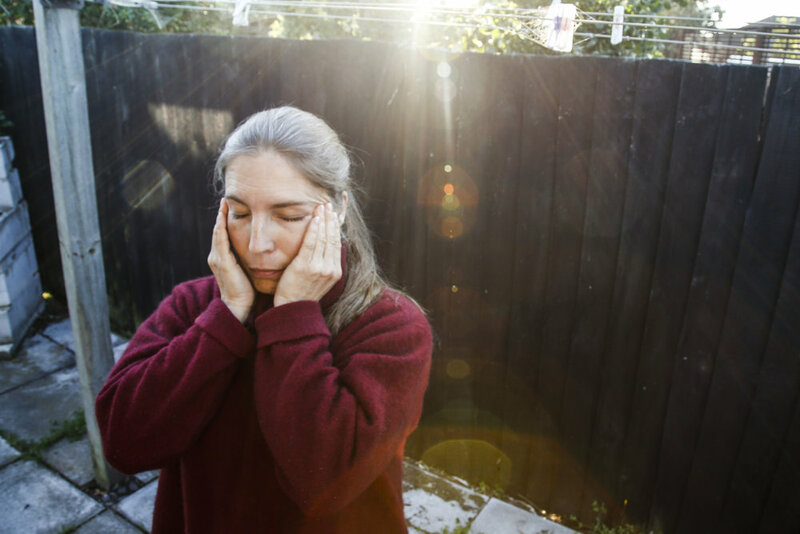 Olli closes her eyes for a moment in between portraits at her Christchurch, NZ home. "I was depressed for 16 years on and off without me knowing it or being able to label it as depression. Getting the emotional help that I needed and not taking myself seriously helped me feel like I wasn’t in absolute despair. Humor was my outlet and makes life bearable." Olli's stilts laid out on the grass at Orton Bradley Park in Charteris Bay, NZ on May 14, 2016. Neil Wooten (left), Ricken's boyfriend, wipes his glasses as Auriel and Olivia Ricken (center) laugh together at Orton Bradley Park in Charteris Bay, NZ on May 14, 2016. "My son is so proud of his mum. He goes through the kitchen and tries to balance everything on his nose because he's seen me do it. It’s very sweet," says Ricken. Wooten and Ricken were also accompanied by Auriel's father, Andre Heppelthwaite (right). Ricken and Heppelthwaithe try to maintain a good relationship for Auriel. Wooten and Ricken share a kiss as they leave the park. After I left New Zealand, both Olli and Auriel moved in with Neil and now live together. Olli shares a laugh with her Clown Doctor co-workers. Ricken poses for a portrait in her Christchurch, NZ home while wearing her Clown Doctor costume on May 3, 2016. "Through my line of work, I have the privilege of dealing with lightness. I don’t have to deal with destruction. Although it’s been extremely hard with housing, raising a child by myself having no money since the earthquake, every little thing makes me happy. I see the positive way more than before and I'm really grateful." WHATEVER TRAUMA YOU'VE HAD, YOU CAN STILL LOVE YOURSELF." Everything's going to be alright is a multi-part photo series and documentary film. It explores the different ways in which people use humor, laughter and entertainment to heal themselves. It also focuses on the powerful impact that humor and laughter has on both mental and emotional health. Part one of this series focuses on three different clowns: Lisa Wingfield, Chris Carrow and Olivia Ricken. 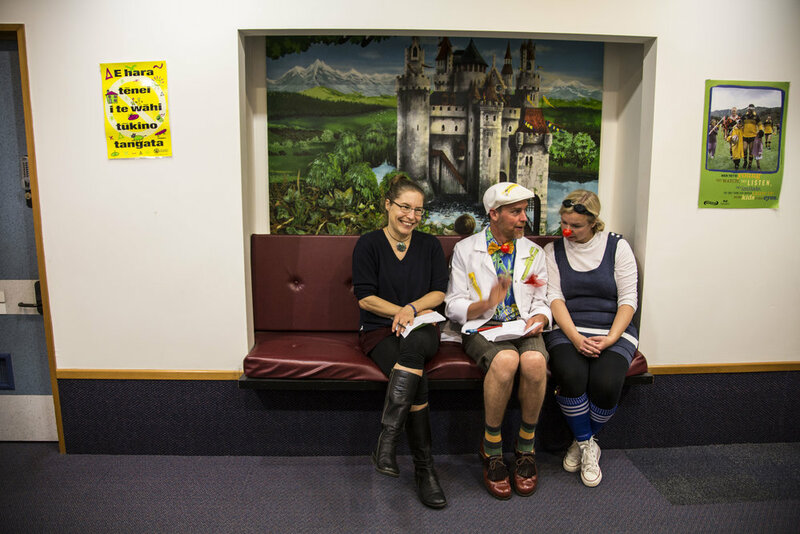 Despite losing their homes and circus schools to the 2011 Christchurch Earthquake, they still continue to bring joy to others through their work.